Until recently, the name “Berkshire Hathaway” was important and familiar almost exclusively to Wall Street, stakeholders and business blogs. 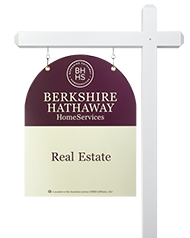 But now, a stroll through a suburban neighborhood finds Berkshire Hathaway Home Services “for sale” signs. What had been Prudential Real Estate is now a sibling of Fruit of the Loom, Dairy Queen, MidAmerican Energy and dozens of other entities. On the face of it, broadening awareness of the Berkshire Hathaway portfolio makes sense in that the process appears to be laying the foundation for company stability and growth in the post-Warren Buffett era. One of the world’s wealthiest individuals, Mr. Buffett is 84 and yet from some angles, other plans for his succession appear to remain undisclosed or unresolved. All of this would seem a sound strategy in the short term, but let the marketing experts intent upon building the Berkshire Hathaway brand by promoting the company ahead of its billionaire owner take note of today’s GE. In the 80s, under CEO Jack Welch, GE became the darling of Wall Street. Streamlining the company and eliminating bureaucracy, Welch believed that a company in the GE portfolio must either be No. 1 or No. 2 in its industry and he transformed GE into a recognized owner of highly successful assets. In 1999, Welch was named Fortune magazine “Manager of the Century.” GE’s earnings were significant and its stock was, pardon the pun, electric. Jack Welch was the face of GE as Warren Buffett is that of Berkshire Hathaway. Today though, long after Mr. Welch retired, GE is among the worst stocks in the Dow, its shares down some 7 percent this year. According to many Wall Street pundits the company is bloated, blurred and increasingly unmanageable. Some suggest GE ought to be broken up in the manner of AT&T. The “halcyon” days of Jack Welch are long over. Jack Welch, as the GE brand, is largely forgotten. One day, Warren Buffett, too, will be largely forgotten. What will be left are a ubiquitous Berkshire Hathaway brand name and a portfolio of incredibly diverse assets that will require adroit management and astute acquisition and divestment strategies. Short of this, Berkshire Hathaway will risk becoming the “also-ran” GE is today. If you’re looking for a creative person who can think outside the box and give YOU something totally new “inside the box” (as with the FedEx logo), contact Lindon.